We are now up and running for the 2013/2014 year and a big welcome to you all. As discussed at last weeks meeting, you need to have a think about what issues you feel the strongest about. At our next meeting, we will be forming groups to tackle the various issues and you will need to choose where you want to go! If you can’t remember what issues people brought up last week, then you can check the board below. In our Middle School GIN-CAS team, 8 students were selected to fly to Singapore to attend the 2012 GIN-CAS conference in Singapore. The 8 students that attended were Marshall, Kazuki, Yuki, Mia, Emily, Naomi, Sophie and Hye-Won. During the conference the kids attended workshops, lectures, many fun activities, and performances. These 8 GIN-CAS representatives have been working on forming a plan to help other people. We saw many inspirational speakers talking about many things that are issues in the world. When we saw these speakers many of them were promoting their NGO (Non Government Organization). After visiting many of these NGO’s we decided on one NGO to support. We chose an organization called Room to Read. An organization which helps issues such as poor education and gender equality within education. Though after we research more on this NGO we decided it may not be great for our school. So from that we created our own plan that involved experience and learning. We plan to do a Read-a-thon and an experience week for our year 8 students. For the experience week we will try and show kids how some people in our world live and don’t have access to the same resources we do. 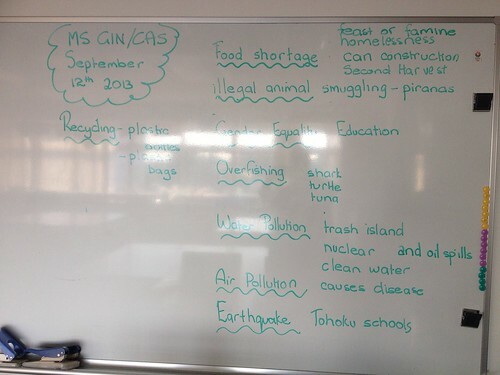 Our GIN-CAS group is now working to put this plan in action by June 21st of 2013. All the money will go to donation. Anyways, please wish me good luck. While I cut the vegetables, my hands would slowly start to freeze, but luckily there was a steaming bucket of water. That day was a day I had never experienced before. And I don’t think I will ever exoerience this kind of lifestyle. We had to clean our hands and the cutting utensils with ice cold water spraying out of a hose. It was outside and the vegetables went in a huge trashcan. I felt good in the taxi, leaving, of how I helped feed hundreds of homless men. It was a very unique day, and am wishing to do it again, next year.